Never guess at your models wounds again. Being a game you often have the need to track effects or damage done to your models. We have used everything from little glass beads, slips of paper or the always faulty memory method. All of these work but have their own problems. Beads work nice but can be difficult if you need to track more than one effect on a model. Slips of paper or list are also good but it is very easy to shift damage around to the wrong model either by mistake or for less honorable reasons. Finally the memory method is a lesson for disaster if you have more then 1 model to keep track of. Face it we can keep billions of facts in our heads but most of us can't keep more than a few numbers without mucking stuff up. Also there is the whole less honorable thing to deal with again. Here is how we solve some of those issues on our games. First up we have damage/tracking markers. 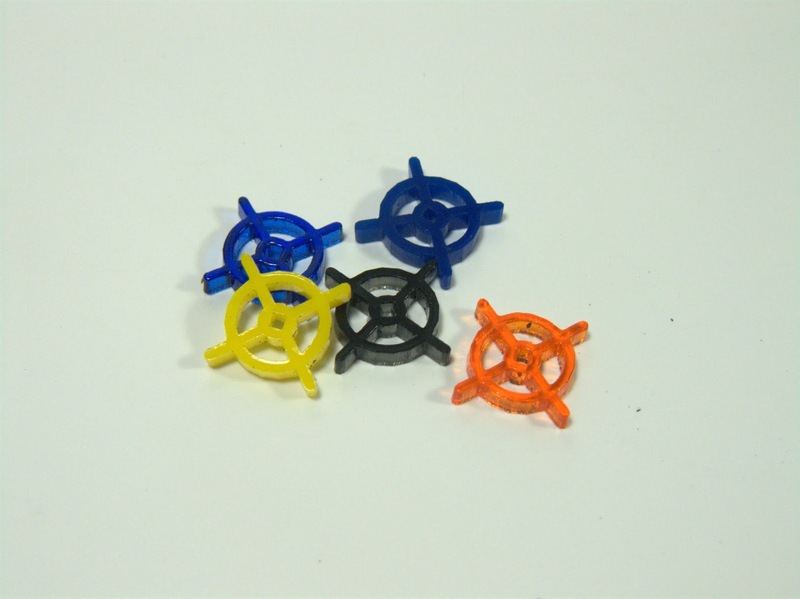 These come in a variety of shapes and colors. 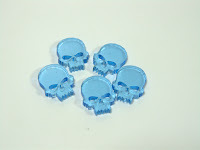 The ones shown here are transparent blue skulls and multicolored cross hairs. Each is about 1/2" tall and comes in a pack of 20. 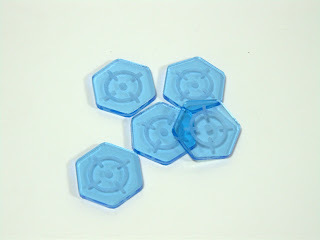 We also offer 7 other shapes for tracking other effects. Flames, potion bottles, hazard triangles, cross hairs, swords, lightning bolts and magic swirls. All shapes are made from acrylic and come in default colors but any of 9 different colors of acrylic (red, purple, blue, green, yellow, orange, white, black and clear) can be selected. For more detailed tracking we offer larger 1" engraved makers. These are perfect for specific effects. The ones highlighted here are for target tracking, perfect for things like Tau marker light hits in Warhammer 40K. We offer 7 patterns (flames, potion bottles, skull, cross hairs, swords, lightning bolts and magic swirls) as well as custom user supplied versions*. These are sold in packs of 10. All come in default colors but any of 9 different colors of acrylic (red, purple, blue, green, yellow, orange, white, black and clear) can be selected. The final item in this release are base damage rings. These base rings are offered in standard 25mm, 40mm, 60 and 80mm bases sizes no lip GW style bases and small, medium, large and extra large Warmachine/Hordes bases as well as large ovals and long pill style bases. Each base will fit 1 model and a 12mm 6 sided die (not included) for tracking hits. Never again lose a marker when moving a fig across the board. Each base is offered in clear acrylic. The frosted is just for pictures as clear doesn't show up as cleanly in photos. Each base is shipped in 2 pieces that need to be glued together. We recommend Testors' clear part cement to keep pieces from hazing when glued but standard CA glue will work. When ordering be sure to specify GW or Warmachine/Hordes style bases so we send you the correct version for your game system. * Sorry we cannot engrave trade marked designs but will work with you to design engravings that will fit your needs.